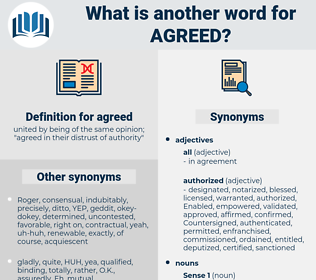 What is another word for agreed? united by being of the same opinion; " agreed in their distrust of authority"
Negotiated, acknowledged, agreeable, established, consensual, Stipulated, decided, determined, appointed, co-ordinated, consensus-based, prepared, apprehended, committed, planned, acceptable. dealers, GATS, agreements, trips, decided. Argued, preferred, Regarded, accepting, recommendation, arranged, acknowledge, reaffirmed, Embraced, rejected, correspond, Corresponded, recognise, share, sharing, shares, Ceased, Refused, encouraged, subscribed, merged, declared, Urged, alleged, recommended, suggested, consents, appreciated, Managed, Favoured, realized, delegation, Converged, ratification, adhere, Adhered, organize, reported, Emerged, asserted, finalized, pledge, pledged, treated, overlapped, together, supports, considered, Compromised, ratified, conclusions, confirmed, recalled, cleared, Testified, Arrived, concluded, Praised, affirm, affirmed, emphasized, geneva, Acceded, assumed, Embarked, Condoned, retained, learned, Acquiesced, revised, allocated, changed, revealed, Contributed, resolve, undertake, Undertook, addressed, acquired, admitted, Caught, conceded, programme, Insisted, Believed, decisions, described, Explained, initiated, Indicated, implemented, Challenged, ended, associates, released, Responded, expressed, Conformed, convinced, measurement, reflected, expanded, Referred, calculated, Rated, abandoned, opinions, equal, split, Adopting, disputed, Delivered, welcomed, stressed, Assessed, assured, identified, arrest, arrested, Purchased, minister, ministers, Enacted, settled, credited, predicted, Contended, opinion, Offered, underscored, Viewed, conferred, Coincided, jointly, Issued, program, special, started, contracted, dictated, Was, Were, felt, Worked, underlined, desired, Proceeded, debate, confessed, coincide, Navigated, Deemed, observed, invited, russia, divided, term, access, accessed, hired, completed, saw, validated, Commended, led, advised, reason, Had, convention, objectives, Submitted, briefed, Chose, informed, ruled, michael, spoke, solidarity, Volunteered, Answered, objective, contained, sought, Began, Obtained, withheld, adapted, highlighted, paid, pursued, russian, awards, maintained, wanted, outlined, Incurred, Brought, raised, said, handed, mandated, Upheld, postponed, conference, delayed, Mentioned, ordered, Wished, Tended, Gave, deposits, provisions, figured, Asked, Convened, Discussed, extended, moved, Gained, Told, elected, placed, Entered, rose, Replied, Introduced, attempted, Echoed, advice, requested, contested, struck, halted, AF, Followed, Them, text, covered, plan, Prompted, Attracted, Heeded, solved, powers, invested, pointed, satisfied, Declined, involved, Succeeded, next, Commented, enrolled, Resulted, convicted, finished, marked, rolled, Journeyed, opted, directed, Commenced, laid, needed, Claimed, come, Came, Vowed, added, vetted, noted, enlisted, Fitted, joined, tried, Went, called, Stood, Became, played, Stayed, talks, Talked, notice, noticed, notices, found, licence, locked, states, follow-up, thought, fell, ec, Parties, hosted, applied, backed, council, showed, closed, meeting, Met, kept, fluid, Launched, put, sounded, iii, Did, Got, Negotiated, acknowledged, Stipulated, negotiate, decided, determined, appointed, prepared, apprehended, committed, planned. guaranteed, Argued, preferred, Regarded, arranged, Embraced, rejected, reconciled, signatories, Targeted, Tolerated, Ceased, Attributed, Refused, encouraged, subscribed, regulated, incorporated, terminated, declared, corroborated, Urged, alleged, recommended, sworn, suggested, appreciated, Persuaded, Managed, Favoured, realized, Adhered, report, reported, asserted, finalized, support, assigned, pledged, governed, treated, foreseen, appropriated, considered, Compromised, designated, ratified, opposed, Accommodated, confirmed, cleared, Arrived, strengthened, concluded, Praised, emphasized, Acceded, assumed, Embarked, chairperson, retained, learned, Undertaken, substantiated, calibrated, allocated, forged, changed, decreed, consultation, addressed, acquired, admitted, principles, Caught, conceded, Believed, dedicated, described, Explained, initiated, associated, Indicated, Negatived, Drafted, implemented, Responded, Espoused, related, expressed, Countenanced, finalised, Exerted, perceived, convinced, forecast, formulated, Referred, Disbursed, calculated, reviewed, Afforded, elaborated, nominated, obliged, Excluded, Liquidated, Delivered, welcomed, stressed, Examined, Assessed, Created, Denied, assured, identified, arrested, Purchased, Enacted, settled, entrusted, credited, Enshrined, predicted, presented, Captured, Instituted, opinion, Offered, motivated, Viewed, dismissed, supposed, Been, written, Issued, proceedings, started, Enabled, contracted, embodied, felt, Worked, accession, interviewed, lent, desired, Recruited, Termed, coincide, seen, Deemed, procedure, observed, invited, accused, pronounced, enforced, divided, read, produced, sanctioned, located, accessed, hired, completed, Resumed, aligned, validated, led, Had, Compiled, valued, convention, employed, Submitted, Dealt, briefed, informed, adjusted, ruled, Begun, complicit, Consulted, Answered, Construed, Achieved, contained, imposed, sought, disposed, Obtained, withheld, announced, adapted, highlighted, paid, Commanded, pleased, pursued, maintained, wanted, outlined, Incurred, attended, Judged, Brought, reminded, said, mandated, honoured, Upheld, postponed, attained, expended, Mentioned, indeed, ordered, conceived, Wished, Aimed, sent, designed, risen, Asked, Convened, assembly, Discussed, extended, moved, Gained, entitled, devoted, Told, elected, placed, compelled, Entered, Replied, Introduced, Returned, advanced, Echoed, advice, requested, matched, struck, halted, Screened, chair, session, Followed, text, covered, Prompted, Attracted, Heeded, solved, invested, pointed, satisfied, involved, Succeeded, enrolled, Logged, conducted, Listened, finished, continued, opted, directed, Meant, drawn, laid, needed, Claimed, come, fit, added, Subjected, vetted, noted, Fitted, gone, bound, Occurred, joined, tried, become, called, Caused, united, Talked, taken, notice, noticed, suited, found, Inducted, locked, thought, Notified, mixed, Parties, applied, Shown, backed, formed, closed, Met, kept, based, mounted, Launched, 2006, 2004, put, Counted, Got, Negotiated, founded, named, acknowledged, established, decided, determined, appointed, prepared, apprehended, committed, planned. Disagreed, engaged, consultation, Complied, Achieved, Listened, Concurred, agreements, established, sympathise.
" I believe it is," he agreed. Well, you have agreed to meet Mr. Dunnerwust? asgard, aigrette, acridid, Azurite, acerate, akaryote, acquired, accrued, akeridae, assert, asserted, accrete, acardia, access road, acridity, acaridae, acrid, acaryote, acrididae, awkward, aggrade, assort, accord, ascaridia, accredited, ague root, aigret, assured, assorted, acarid, ascaridae, accurate, accredit.